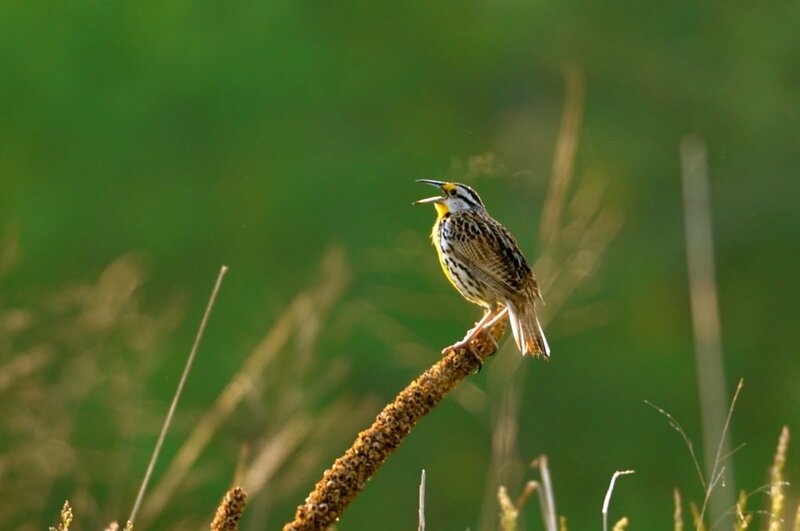 Eastern Meadowlark. Photo by Amy Johnson, Virginia Working Landscapes at the Smithsonian Conservation Biology Institute. The sun’s energy has transformed our brown pastures into green carpets of food for our beef cattle. The surge of spring is upon us. Red Wing Blackbird males are singing their shoulders off, “Concareeee”. Meadowlarks are singing, “Spring of the yearrrr”. Because of the vast grasslands in Swoope their populations are not declining here. Elsewhere they are, along with other grassland species of birds. We have eighty-three calves on the ground; eight heifers to go and 19 cows. 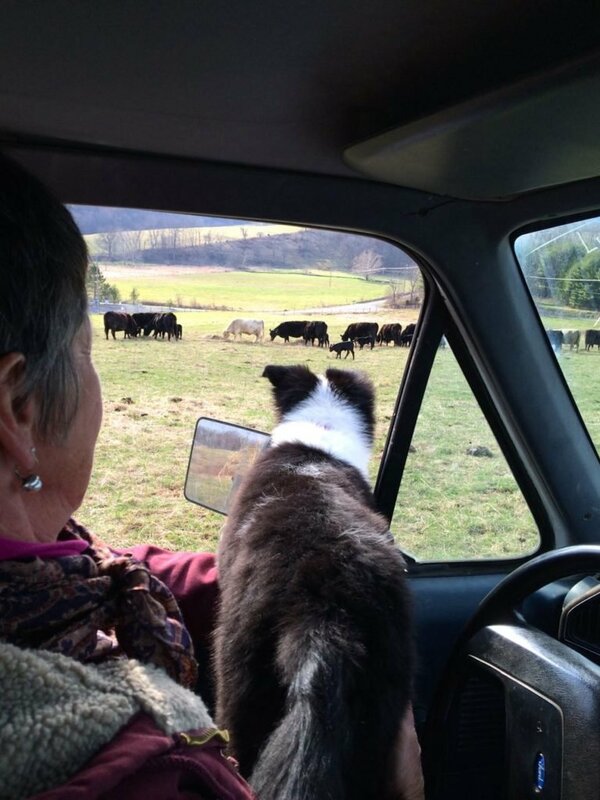 We live and work on a cattle farm in the famed Shenandoah Valley of Virginia. Winter Storm Thor was pretty brutal. By the time it arrived on March 5th, six cows had calved and snow covered the ground. Eight were born during the storm. It was the worst possible weather for calving; thirty one degrees with snow and freezing rain. 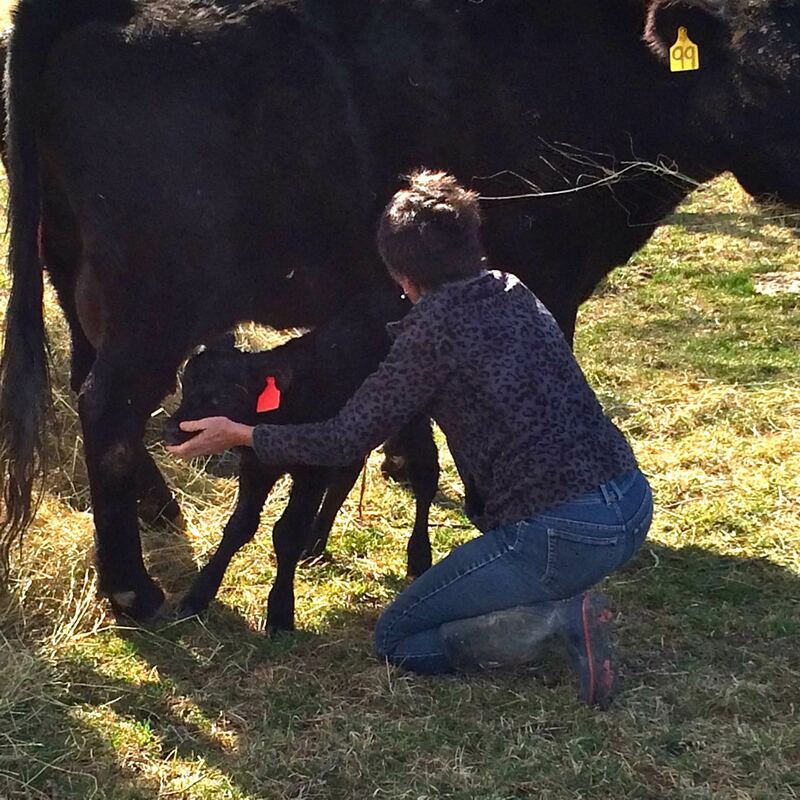 During the storm, cow #116 delivered her baby, unbeknown to her, into a groundhog hole. He never got up. When we found him he was in the process of dying from hypothermia. We brought him in and placed him in the calf “cooker,” which is a big “lunch box” looking container with a heater and fan. After about seven hours in the cooker he warmed up enough to begin a calf’s instinctual sucking motion with their mouth; time for him to go back to his mother. We fed him a bottle of colostrum to “jump start” him, loaded him in the tractor and dropped him near his anxious, waiting mother. They literally hooked up – “mouth to teat”, in less than a minute. Several weeks later we noticed the ends of his ears had frozen off so his head looks just like a mouse. We nick named him Mickey. Another calf, red tag #121, also born in the storm, lost part of his left ear. Most likely a cow stepped on his ear while he was sleeping and as he jerked awake the tag and part of his ear came off making it sort of pointed. We call him “Spock”. Jeanne training a calf to nurse in the field. Yellow tag #99 successfully delivered twins on March 17th. She knew they were both hers but favored only one. She would smell and lick #2 but wouldn’t let him nurse. Jeanne tried for two days to get her to accept both babies. As a distraction, a pan of grain was offered while Jeanne positioned the hungry baby at the teat. Jeanne does magic with cattle and they trust her. She milked the cow right in the field and trained the unwanted baby to nurse. After two days the mother still did not accept the second baby without grain. He’s now a bottle baby in the barn enjoying three meals a day. 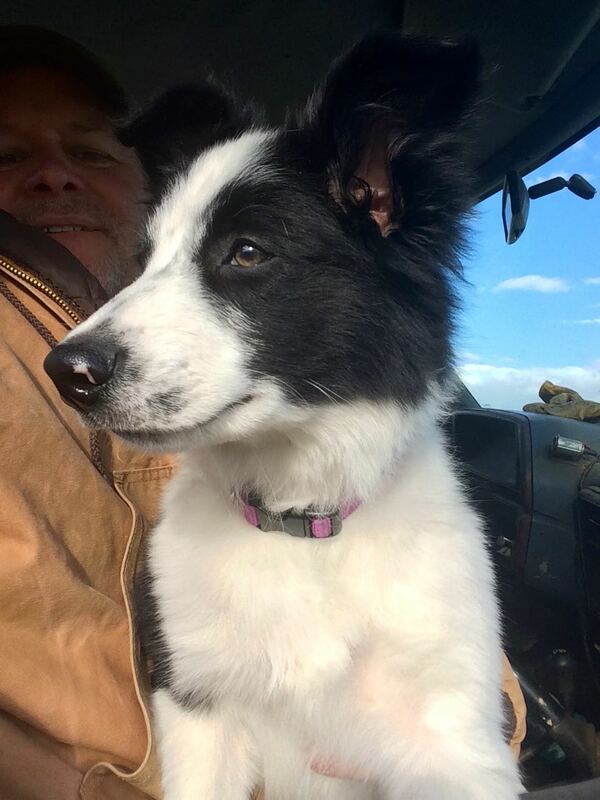 We have a new addition to our family, a Border Collie puppy, “Valentino” or Val for short. 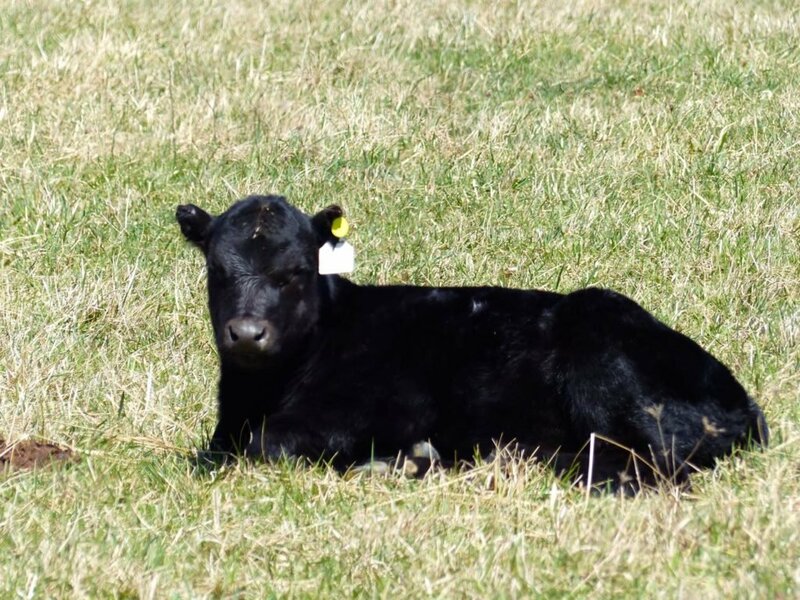 His mother hails from a working sheep farm in Highland County, Virginia and his father hails from our neighbor’s working cattle farm in Swoope, Virginia. He is fitting right in. Valentino immersed into the farm. Click on this image to see a 13 second video. i want a calf for our boat. Ouch, frozen ears! It sounds to me as if you and your wife have been doing heroic work for awhile. Glad it has warmed up at last, and hope it stays this way. We need rain. If type of life is not from God, I don’t know what is!! Val is the new addition to your family. I think Dexter had a whole lot to do with it. Nice writing Bobby. Love the lady in the Pearl Earing! What an amazing story to tell! Nursing a calf back to life is such a scary, but wonderful experience. Knowing that even when all hope may seem lost, life can still be revived with patience and care. Honestly, Mickey looks adorable with his ears being so small. Those ears are a symbol of how hard life can be. However, they are also a symbol that even if things change, they can still be just as good. As for the pair of calf twins born, I had no idea that a mother would reject their own child. Is there any specific reason a mother would do this? If this situation occurred in the natural world, would the neglected calf die from a lack of milk? Nichole, thanks for the comment and questions. Two to three percent of cows have twins. So in a herd of 100 we will have 2 to 3 sets of twins. About 20 percent of the mothers that have twins actually take both babies. This is what we have experienced in our cattle herd. The abandoned calf would perish because the mother will not let it nurse.